Intention: Develop basic backhand technique. 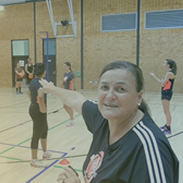 Players line up on one side of the net with the coach on the other side of the net. Coach feeds the ball to the first player in the line. Each player hits the ball 3 times. 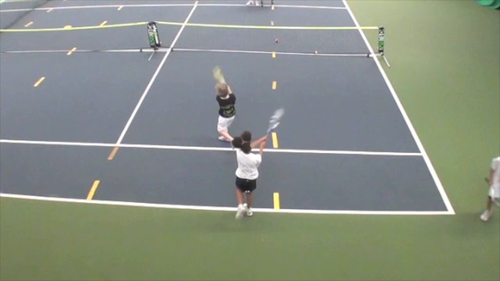 Shot is a backhand played with a neutral hitting stance and the player is to finish balanced on one foot. Those in the line mimic the shoe of the player playing the ball. Once the player has had their 3 shots, they then collect 3 balls to return to the hopper before joining the back of the line. Demonstrate a blanced and active ready position. Grip: Eastern. For the two-hander player, an eastern grip with both the top (non-dominant) and bottom (dominant) hand. Ensure the player is taking the racket back in two hands by turning the hips and shoulders to the side. Basic low to high forward swing. Contact with the ball at the side of the body and slightly in front. Follow through to be long and high. Move on to "Basic Backhand Technique- Progression 2"